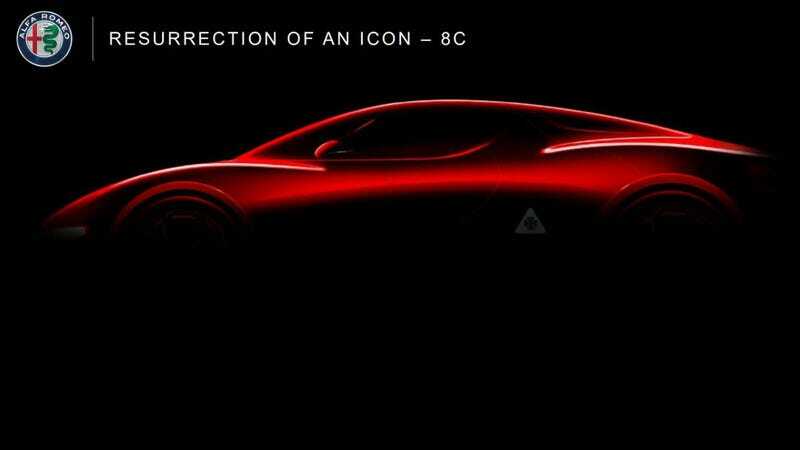 The gorgeous Alfa Romeo 8C Competizione might be making a comeback. I know, I’m filled with emotion at the thought of that, too. But not just as a another front-engined sports car; rather, as an insane mid-engined supercar. Be still my heart. Unveiled today as part of Fiat Chrysler’s five-year plan presentation to investors in Italy, the automaker has some very ambitious ideas for the Italian marque. Not only could the Alfa Romeo GTV return, the 8C Competizione could also be resurrected with over 700 horsepower from a twin-turbo engine in its middle and electric motors driving its front wheels. FCA says that its theoretical car would have a carbon fiber monocoque chassis and can spring from zero to 62 mph in under three seconds. This was all part of an investor’s presentation, so more specific details were annoyingly absent. The original 8C used a Maserati GranTurismo platform, complete with the 4.7-liter naturally aspirated V8—one of the most glorious-sounding engines ever produced—and marked Alfa Romeo’s kind-of-sort-of return to the U.S. market. Yet, the car was exorbitantly priced (it started around $300,000), and only 500 coupes were ever made worldwide. Just 90 made it to our shores. So it wasn’t truly a return because most people couldn’t own them. I’m taking this 8C supercar news with a tremendous grain of salt, though. FCA once promised us a Dodge Dart SRT, too. I haven’t forgotten.